40 ct. Summer Khaki over-dyed with Tan Rit Dye, various silk threads (1 over 2). P.S. I think that funky bird is actually a peacock, not a turkey. Ann is looking very pretty! I love Ann,you have inspired me to do the sampler, did you post your silk conversions? I am always afraid to do it on my own!! I love that coral house! Very pretty, Nicole and I love that you start from the bottom - gives us another perspective to enjoy. Yours is just stunning! I love seeing your progress on this piece because you're starting at the opposite corner than me. And I do think that is a peacock - or at least hope so. Pretty funky for a turkey, don't you think? Ann looks great...those colors are to die for! What a funky peacock! Looking good and you seem to be making progress. I understand totally about boys and clutter. Ok, you're torturing me. I want to start from the bottom left too. lol! Gorgeous!!!!! You're giving me the inspiration to plow through these letters! Love your progress! She's gorgeous. And I think you're right, I think it may be a peacock - although I would have gone with turkey too! LOL! 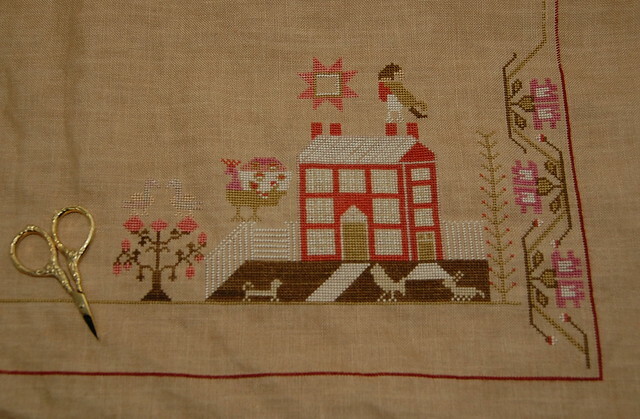 It is lovely to see this stunning sampler from the bottom. Yours is looking wonderful and I love everything that you have done. Yes, cleaning can really be the pits sometimes. I usually spend all day cleaning and at the end of the day, I always wonder where I have been. - Sandra. The more you stitch on this, the better I like it. The colors are just so pretty. Love it! I think you're right that it's a peacock after all. Love Ann Nicole! Such fabulous colors! Enjoy your time with her! 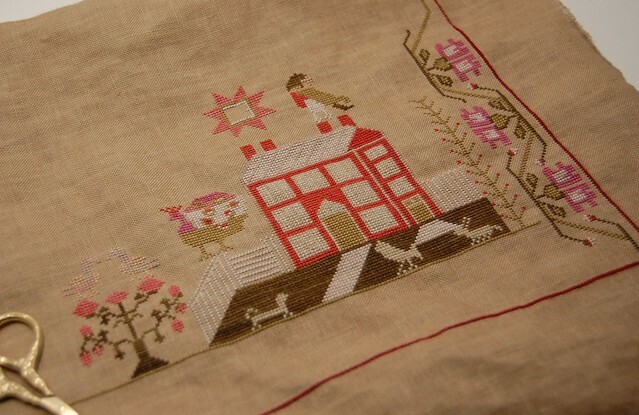 Choosing to do spring cleaning is good, I guess, it makes you happy when you get to sit down and stitch a bit after that! Your Ann is looking marvelous. What beautiful work! It's fun watching everyone stitching Ann and I love the colors. It looks beautiful Nicole !!!! Another lovely Ann in the making! hmm, so that's a peacock...just makes me want this one even more and I really don't need another big start! Beautiful, Nicole!! I LOVE those colors against that fabric.